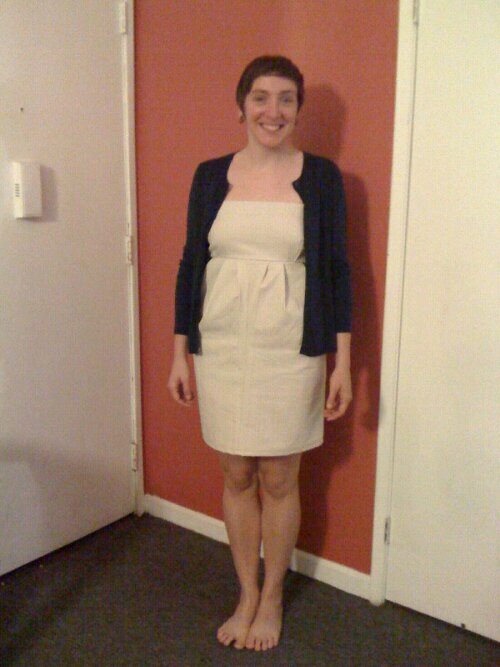 Over the weekend, I took apart an old pair trouser-leg cream colored pants from Gap (boring, basic and out of style) and refashioned them into this dress. The top of the legs became a pleated high-waisted skirt, and the bottom — including the hem — was repurposed as a bodice. For the bottom, I had to make up the pleat pattern as I went along, which was hard since I don’t own a single thing with pleats, especially a more structured dress! But some pins, an iron, and a well-lit mirror helped me work it out. On top, I tweaked existing and new seams to make darts for a slightly more fitted shape and (with some supplies and encouragement from Erl) used some elastic in the back to snug up the fit. Of course, I know a few things I wish I’d done differently, such as use a shorter zipper or add some shaping seams in the back (which I still might try), but on the whole I’m really happy with how it came out! With a cardigan and/or belt, it comes together nicely. looks amazing! i will have to see it in person!